‘Slippery slopes’ – the ultimate red herring. 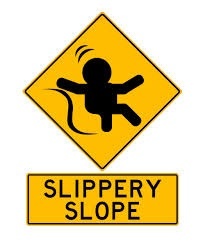 An actual slippery slope is a muddy hillside, where one small, apparently safe step can lead to a slide to the bottom of the hill on your backside. The physics behind this is that the static co-efficient of friction is greater than the kinetic co-efficient of friction. In other words, it takes more force to start a bottom sliding than it takes to keep it going. Matt Ridley, a journalist who sits now in the House of Lords, pointed out in an article in The Times and on his excellent website ‘The Rational Optimist’ that current debates in politics would make you think we stand on top of a mountain range of slippery slope. We have heard that assisted dying will lead to widespread euthanasia, artificial life will lead to biological warfare, and if I tried to list what opponents of gay marriage have said that would lead to, this blog would explode. Yet Ridley points out that the slippery slope metaphor is quite misleading when compared to the actual truth in the UK’s well functioning democracy. Politics just doesn’t contain the change in friction that happens on muddy hillsides. However well one step down the hillside has gone, the next step will meet with fierce resistance, as will the next step, and so on and so on. Sometimes we have actually reached the mythical bottom of the muddy slope. Ridley explains that when that has happened it isn’t because it was slippery, but because we as a society collectively decided that we wanted to go further at each stage. When the Great Reform Bill was voted in back in 1832, Conservatives feared that it would set us on the road to universal suffrage. After a lengthy struggle, that did indeed happen, but it wasn’t a slippery slope, it was because society could no longer justify women not voting. Is that a bad thing? When homosexuality was legalised in the late 1960s, many religious people feared that it would lead us down the road to gay marriage. It did indeed do that, but it took many steps and was only because society chose to take those steps. Meanwhile, over the last 40 years Ridley points out we have been interfering in reproduction, despite being repeatedly promised that bad things would come from it. The invention of in-vitro fertilisation (IVF) in the 1970s was supposed to be the precursor to eugenics, where people would use the technology to have superior babies by using the sperm of high-performance donor fathers. Yet in truth the technology has been used almost entirely to help people have their own babies, to cure the cruel disease of infertility. The centre of Ridley’s article is that right now there is an ethical debate on mitochondrial replacement therapy (MRT). This promises to cure human mitochondrial diseases by replacing the mother’s cell batteries with those from a donor. This will allow certain people to have their own children without horrible diseases, but a critic has already talked of “a slippery slope to human germline modification”. 0.002% of genes are in the mitochondrion…what’s to stop somebody changing the 99.998% of genes in the nucleus of the egg? What’s to stop us ending up pall wanting and having ‘designer’ babies? The answer is that it will be illegal to use MRT for any purpose other than the prevention of mitochondrial genetic disease. Any change to that will have to see the law changed, and in our democracy that is a very slow process. A sticky slope, not a slippery one. Given that much of the opposition to any new techniques of genetic and reproductive medicine are from the religious right, Ridley would be interested to know where in the holy book it says that a child should suffer for the whole of their life rather than the sanctity of natural genomes and ailments be interfered with? But especially when the concern is about a vaguely defined and legally implausible crime that might be possible to commit in the distant future. There are genuine arguments against many of the changes we are discussing. Lord Ridley and I would hope that the ‘slippery slope’ is seen for the red herring that it is.